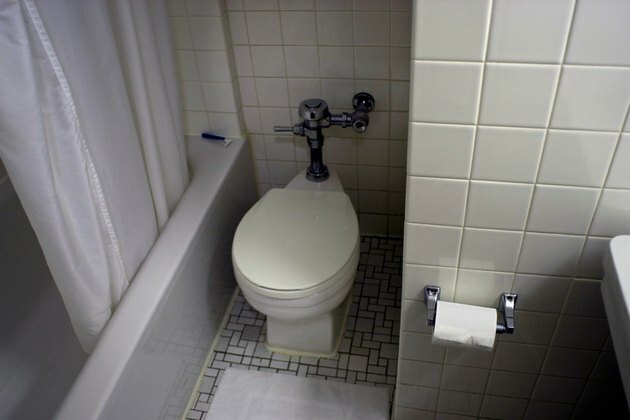 Each pull of a toilet's handle flushes precious, potable water down the drain. As an increased interest in water conservation drives innovation, manufacturers continually reduce toilets' water usage per flush. In addition to resource conservation, alternative flushing systems often reduce or eliminate the need for septic tank or leach field systems. Keeping in mind your budget and willingness to depart from the familiar, you can choose a toilet that suits the requirements of your remodel or construction project. Quality over quantity: tankless systems flush with short, powerful bursts. Familiar to most homeowners, the standard flush toilet's rectangular tanks fills with several gallons of water, flushes by handle and automatically refills. An upside-down, S-shaped drain, called a siphon, runs from the toilet's bowl to a floor drain. When a standard flush tank quickly empties its contents into the bowl, pressure changes in the siphon tube and forces the bowl and its contents to empty. Although generally the least expensive type of toilet, a standard flush toilet uses the most water per flush. A tankless toilet's bowl and seat typically resemble the bowl and seat of a standard flush toilet. However, in place of a tank, tankless toilets have a high-pressure flushing assembly. Tankless toilets in commercial or public structures often have exposed, chrome-plated piping. Residential models frequently conceal piping behind the tank or within wall framing. Tankless toilets use substantially less water per flush than standard flush toilets. However, high-efficiency tankless toilets are considerable more expensive than standard toilets. Dual flush toilets reduce water use by offering separate options for liquid waste and solid waste. Thus, the term dual flush refers to the two handles or buttons found on this type of toilet. Most dual flush systems are pressure-assisted and low flow. Compounding pressure and low-flow technology, the liquid waste button uses less water than the solid waste button. Dual flush systems are widely available in standard home improvement stores. They save considerable water per flush compared to standard tank systems and typically fall in price between standard and tankless toilets. Alternative toilets use little to no water and many types don't flush at all. Widely used on boats and airplanes, chemical toilets store chemical flushing liquids and waste in containers until disposal. On the other hand, composting toilets create a usable product from human waste. Rather than flushing, composting toilets typically trap waste in a sealed container. Composting toilets' containers turn and incubate waste until its ready for use in landscapes and gardens. Both chemical toilets and composting toilets are suitable for areas that cannot support septic systems or cesspools.